When getting a new compound into the clinic, companies need a well-researched strategy to navigate the clinical trial landscape successfully. However, many up-and-coming enterprises do not possess the resources required to navigate these incredibly complicated and competitive waters. What’s more, the current climate in drug development- acknowledging the numerous other biotechnology and pharmaceutical companies in competition to achieve the same goal- increases the pressure to final accelerated pathways that will get a drug to market the fastest. The pressure to map out and deliver a program quickly, especially for those companies without ample resources or systems in place for clinical development planning can sometimes lead to missed opportunities if pursuing a novel trial design or accelerated pathway. 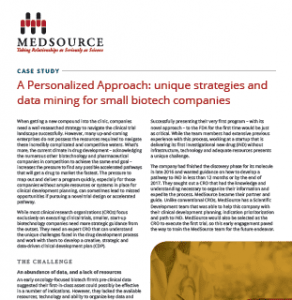 While most clinical research organizations (CROs) focus exclusively on executing clinical trials, smaller, start-up biotechnology companies need more strategic guidance from the outset. They need an expert CRO that can understand the unique challenges faced in the drug development process and work with them to develop a creative, strategic and data driven clinical development plan (CDP).